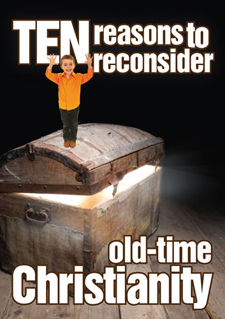 A contemporary tract that encourages the reader to reconsider Christianity. Included amongst its ten reasons, this booklet points out that, contrary to criticism, the Bible documents are reliable, archaeology consistently backs up Bible history, the evidence of God's existence is strong, and shows that believing in God brings inner security. Printed in full-colour throughout, 36 pages, A6 size, on quality paper with eye-catching design and written in a non-confrontational, conversational style. A Shining Lights resource. Part of a series of contemporary gosepl tracts by Dave Mann. Contact us for bulk purchases. Dave Mann graduated from the Bible College of New Zealand (Laidlaw College) and toured for a year with a YFC evangelistic band. He then served with a rural evangelistic ministry for seven years in New Zealand, followed by eight years at Bartley Christian Church in Singapore as Pastor of the Youth and Young Adult Ministries. Dave is now reengaged in evangelistic ministry in New Zealand. He loves to climb mountains with his wife Heather, and they have three young boys. He also is a keen musician. Help: Click 'Add to Cart' to purchase the printed book version. You can continuing browsing other Castle titles after adding this book to your cart. To view your cart click 'View Cart' in the top menu. Powered by PayPal (PayPal account not required for purchases).